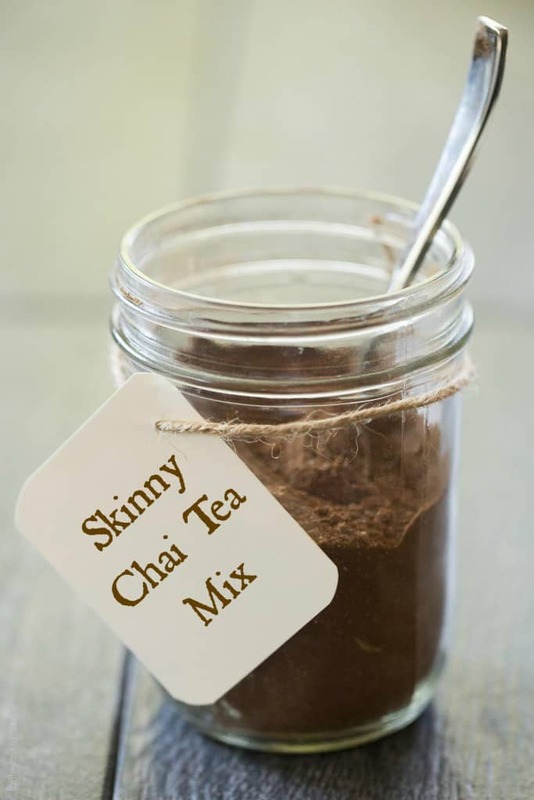 Instant skinny chai tea latte mix – an instant powder mix made with dried spices. Just add almond milk and honey for a delicious chai tea latte that is dairy free! Josh has a little girlfriend. Her name is Mila. I went to school with Mila’s mom. And coincidentally Shawn used live next door to Mila’s dad. Small world! We all reconnected again at the hospital when both of our babies were in the NICU together, born just 4 days apart. It was SO nice having them there to talk to. And more importantly laugh with. Nothing bonds you faster than commiserating over NICU life. Brought much needed sunshine and brightness to those windowless, long hospital days. With our babies so close together in age, we are in the same stages of everything. We have each other to check in with to make sure such-and-such is normal. Does Mila spit up allllll the time to0? Or share newly discovered parenting tips. If Mila has really bad gas like Josh does, you’ve gotta get The Windi! Feel safe to share scary thoughts. Josh has been napping for 2 hours, and I just checked to make sure he’s still breathing for the 10th time. Please tell me you do that too! And my favorite is to share funny stories. In the past 1o minutes Josh has peed, pooped and spit up on Shawn! Mila’s mom and I finally got the together with our babies for the first time since leaving the hospital. It was SO much fun! We sat them next to each other for a picture, and Josh sneezed on Mila. I think we need to work on his flirting. We talked for 4 hours while our babies napped on us, and sipped these skinny chai tea lattes that I made for us from my newest obsession, my instant skinny chai tea latte mix. Lately I am absolutely obsessed with chai. (chai spice biscotti’s, I’m looking at you) I don’t really drink coffee because I get way too jittery from all that caffeine. But I miss getting fancy, tasty coffee drinks. Chai tea lattes are perfect for me! I love all of all the warm spices and aromas. What I don’t love is all of the calories in a chai tea latte. I looked up the calories in my favorite coffee shop chai tea latte, and it was a whopping 270 calories. Yikes! I had to find a better solution. Otherwise this baby weight would be here to stay! 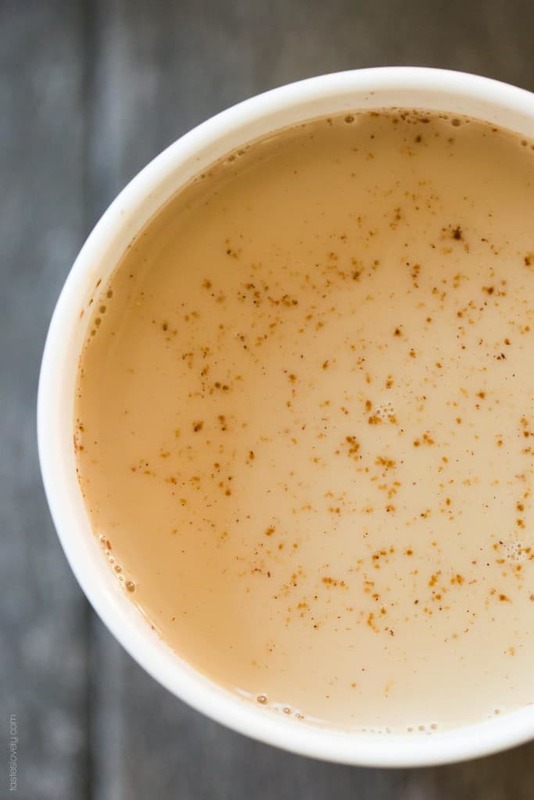 This skinny chai tea latte is less than 70 calories! I saved a ton of calories by using Born Sweet® Zing™ Zero Calorie Stevia Sweetener. 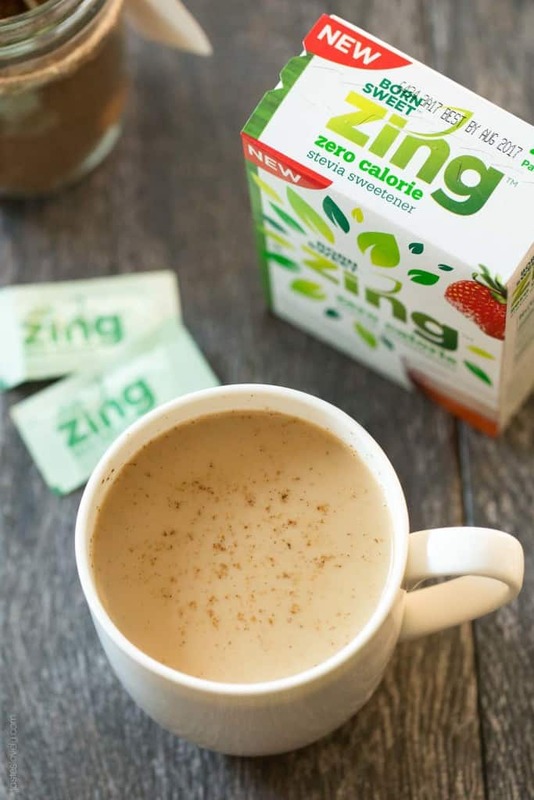 Zing™ Zero Calorie Stevia Sweetener is made with only real ingredients – nothing artificial. 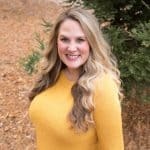 Perfect solution for those who want to incorporate a zero calorie sweetener as part of living a healthier lifestyle and demand a delicious, sweet taste, with no trade-offs. I like sprinkling it into coffee, teas, smoothies, over fruit and other favorite foods and beverages. I wanted to make my own mix of chai tea so I could customize the amount of spice to make it the perfect balance of spices to meet my taste. Feel free to adjust the recipe to suit your own preference. Add in more or less of each spice until it tastes the way you like it. 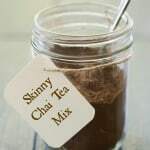 Rather than doing a liquid concentrate which only keeps in the fridge for about a week, I came up with this instant instant skinny chai tea latte mix. It uses instant black tea, and all the wonderful dried chai spices like cardamom, cinnamon, ginger, white pepper, cinnamon, star anise and cloves. 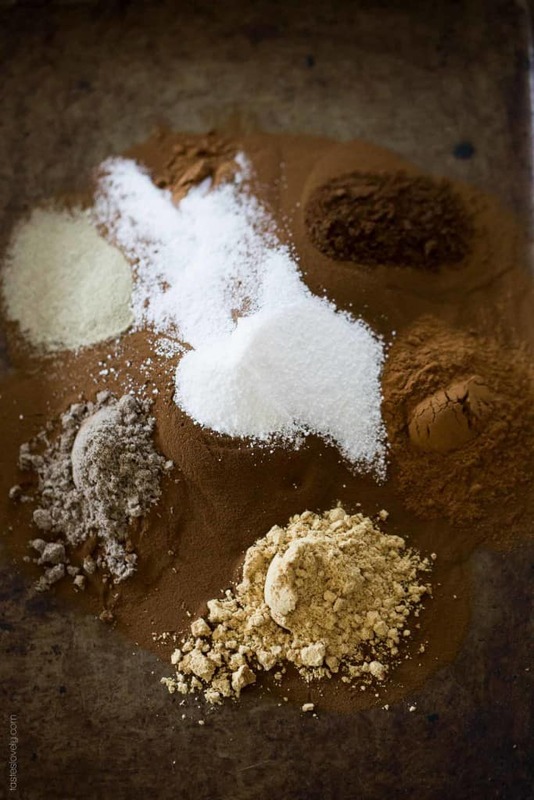 By using a dry spice mix, it will last in my pantry for a year. This spice mix will make 120 servings! I can have a chai tea latte in 2 minutes. Just microwave the almond milk, add in the skinny chai tea mix, and a little honey. Combine all ingredients and stir to combine. Store in a pint size mason jar. Heat almond milk to desired temperature. 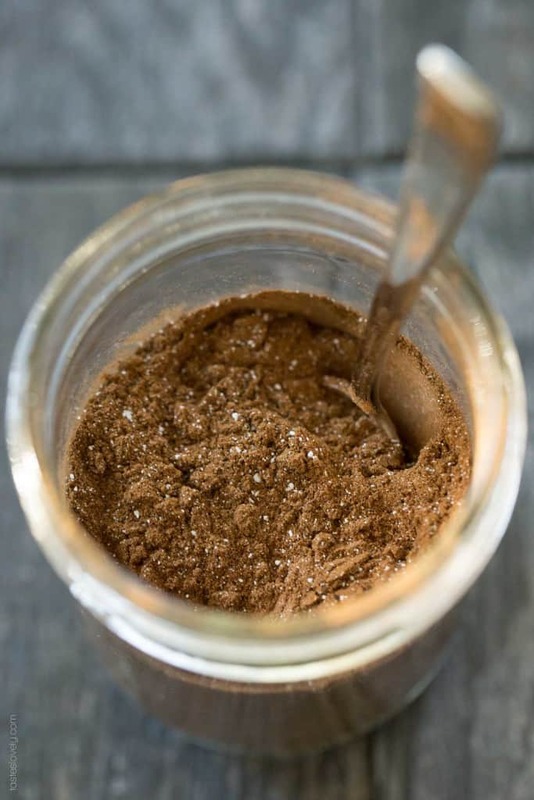 Add 1/2 teaspoon Skinny Chai Tea Latte Dried Spice Mix and 1/2 teaspoon honey (or more or less to taste). Enjoy! -Feel free to adjust the amount of spices to suit your taste. This is my favorite ratio, and I like my chai a tad on the spicy side. But if you like yours milder, just reduce the amount of spices you add. -You can also make iced chai teas! Just add the spice mix to cold almond milk, and serve over ice. Use the same ratios of chai mix to almond milk and honey. -My coffee mugs (in the pictures) actually hold 16oz almond milk, so I heat up 16oz (2 cups) almond milk, add 1 teaspoon chai tea mix and 1 teaspoon honey. Yum! This post is sponsored by Zing™ Zero Calorie Stevia Sweetener. All opinions are my own. Thanks for supporting the brands that support me! Oh don’t worry I bet Josh will learn to woo the ladies a bit sooner than you wish! haha! And I am obsessed with Chai right now too! I love this at home version!! He’s already such a little flirt. I love it. I’m glad you share my chai obsession. You’ll love this DIY version! Natalie, what a nifty little idea!?! I love Chai tea lattes but the powders are sooo expensive, so this will be a great addition to my cupboard. Hope you like it Mariana! Can you share the name of an instant black tea that you like? I’m excited to try this….I have missed my chai, as I’ve been trying to eliminate the sugar in my diet. Thanks!! Instant tea is like instant coffee, you want to get high quality or else it tastes kind of bleh. Hope you love this! And perfect for eliminating sugar from your diet. There is SOOOO much sugar in chai tea lattes usually. Hope you love this when you try it! Oh this sounds SO good, Natalie! 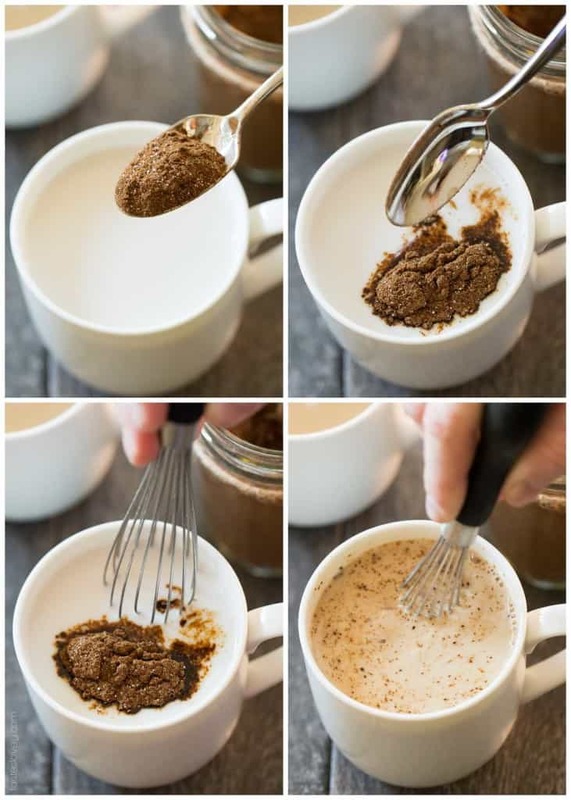 Chai lattes are my absolute favorite (I always order them from Starbucks) so I need to try this homemade mix. Such a wonderful idea and I’m sure it’s better than the coffee shop kind! They’re my favorite too! And these are just as good as Starbucks Gayle! You’re going to love them. Especially since they’re so much cheaper and healthier. Ha! What a small world! That is so nice that you have another mom at the same stage to share everything with :) Bonding over a cup of this chai tea latte sounds perfect! Love this homemade version! I know! Same stages of everything. It’s the best. She’s a very special friend to me right now. Thanks Kelly! Yes, so important. And most of our texts are in the middle of the night. Gotta talk to somebody! Thanks Sarah! I’m a major tea drinker, which is why I can say with such confidence that this chai mix is perfection! I just know you’re going to love it. Hugs! Josh’s first girlfriend! lol, that is adorable! And wouldn’t that be the cutest story ever if they ended up together someday?! That must be so nice to have a girlfriend to talk to who is going through the same thing you are, that is so important in life! Chai tea is one of my favorite drinks ever but I haven’t had it in so long! I need to make some of this delicious looking mix! We’ve joked about that! Would be so cute if they ended up together! Ha! Would make for some funny stories when they’re older. I am obsessed with chai tea too. You will love this Izzy! So easy and tasty! IT’s so awesome that you have that friendship built during their young lives. Having other moms to hang with and confide in is key to a healthy momma. This chai mix looks fab! This looks absolutely delicious! chai tea was one of my favorite drinks in college and many days I’d grab a vanilla latte or a chai tea latte on the way to class. I’m might try to make this at home ! This is just what I’m after. No one else has a recipe including instant black tea powder. I’m looking forward to trying this, I was looking for a dairy free option. You’re going to love it Crystal! Dairy and sugar free for the win! Will this give you the creaminess that the recipes out there give you from the non-dairy creamers? I’d prefer to use your recipe but want that heavenly creaminess lol yours sounds amazing! It tastes super creamy to me! If you want it even richer, you can substitute canned coconut cream! I recaintly found out I can’t have caffiene. So I also thought of chai as a pick me upper. But do you think I can replace the instant black tea with instant rooibos tea? Yes! Rooibos tea works too! I am wondering if you really need the Anise. It is rather expensive when you only need 1/2 teaspoon. Not a spice I would really use other then this recipe. Yes! You can leave out the Anise! Bettie, do you have a co-op or natural foods store? Sometimes get sell spices in bulk so you can can buy just a little. That’s what I do and it’s around 25¢ at the most. Natalie, I bought the teakihut tea on Amazon do you actually use a cup of it? It’s so concentrated and such a small package that I was just curious. I made this since I’ve had to cut out coffee and can’t afford to constantly get chai tea lattes out. Mine was super bland—I’m drinking it now. Are the measurements all listed correctly? I want to love this so much and have quick access to a delicious and healthy drink. Yes! The measurements are all right. But! To be honest, I’ve improved on this recipe with my Paleo Chai Tea Latte recipe, and I like it WAY MORE! Instant tea just isn’t as good sadly. And I completely avoid stevia now. You can make a big batch of my Paleo version and keep in the fridge, then reheat when you want a drink. Or drink it cold! I like it way way way more. This sounds so yummy. I am in the process of ordering my black tea…how many recipes can you get out of one bag? Does it take more than one bag of the tea for a recipe? Looking forward to making this; I need clarification on this: 20 packets Zing™ Zero Calorie Stevia Sweetener (1 tablespoons) Do Zing packets contain 1 tablespoon each of sweetener? I am confused because I am using another natural sweetener and don’t know how much to add. I can see how that can be confusing! Use either 20 packets of stevia, or 1 tablespoon of stevia if you buy your stevia in bulk. There is 1 tablespoon of stevia in 20 packets. Does that make sense? Hope you love it when you make it!